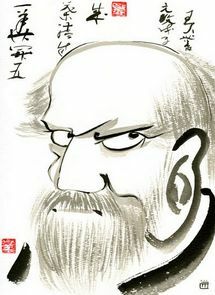 Bodhidharma was the third child of King Sugandha in Southern India. His Status was that of the Warrior Caste, "Kshatriya". His childhood was spent in Conjeeveram, a small Buddhist province south of Madras. He is said to have traveled to China after the death of his Buddhist teacher. Accounts of his activities in China vary considerably depending on the reference cited. The traditional date of his arrival in China was during the Sung Dynasty, 500 A.D. His life in China centers within the Shaolin Temple Monastery in Honan Province, in the Song Shan Mountains. Tradition states that upon seeing the emaciated condition of the monks at this temple, Bodhidharma instructed them in physical exercises to condition their bodies as well as their minds. In several works dealing with Chuan Fa and its Okinawan counterpart, Karate, reference is made to the close tie between Bodhidharma’s Shaolin exercises and these fighting arts. However, evidence of martial arts dates back as early as 500 B.C. with cave drawings and temple statues that appear to show martial arts stances and combat. The physical drills that Bodhidharma introduced to the Shaolin Monks were called "Lohan Shou" or 18 hands of Lohan. The method of learning these moves and becoming proficient with this system was to repeat these moves many times in many directions. This intense focusing of energy coupled with demanding daily physical practice led to excellent health and awareness. He stressed breathing exercises and meditation in conjunction with his self-defense system. As a member of the “Kshatrya” warrior caste of India he would have been exposed to all existing forms of weaponless fighting. The exercises of which he taught to the monks of the temple. Several decades after his death a Chaun Fa master (Ch’uch Yuan Shangjen) verified the existence of Bodhidharma's 18 hands exercise and combined these with numerous forms of his own style. He is credited with increasing the original 18 hand and foot positions to 72, and then later to 170 offensive and defensive movements.